Who doesn’t like snowmen or dress up dolls? 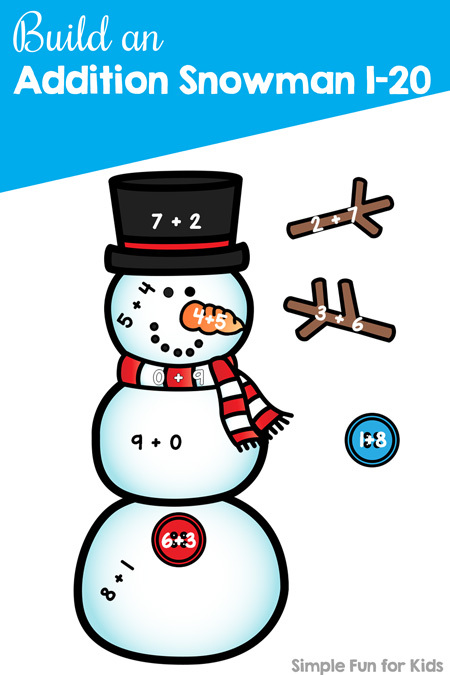 This printable combines both and throws in addition practice and number bonds in a fun way: Build an Addition Snowman 1-20! It works great for reviewing addition facts and working out number bonds, as a fun little hands-on activity for early finishers or as a math center. The sums included go up to 20 for first graders but you can easily differentiate for kindergarteners or advanced preschoolers by only providing a select number of sets. 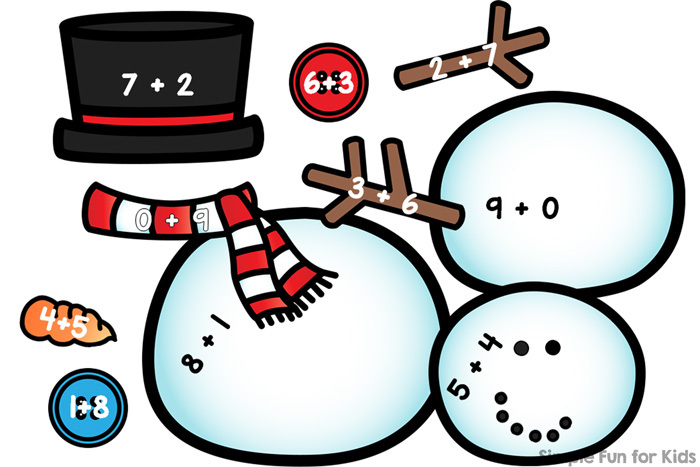 The snowmen cover sums from one through twenty and are all set up the same: Each one has a three-part body, a carrot nose, a hat, a scarf, two arms, and two buttons for a total of ten pieces. On each of the 20 pages included in the file, there’s a large framed number and ten snowman pieces with addends that add up to the same number. You can cut out the framed numbers and store them with your sets of snowman pieces to make it easy to see at a glance which set you’re dealing with. I keep each set in a small Ziplock bag with the number. In addition to the framed numbers on each page, I’ve included four pages of only numbers for your convenience. If you’re still up for it after cutting out all of the snowman pieces, you can cut out the round numbers. Otherwise, there’s also a version that has straight cutting lines to make it easier. Purchase Your Build an Addition Snowman Printable Right Now! Please note that this is a non-editable pdf file, make sure you have the ability to open this file format before you make a purchase. Refunds for digital products aren’t available! After your purchase is complete, you’ll receive an email with instant download instructions.